Hanukkah is an eight-day celebration that begins on the 25th day of the Jewish calendar month of Kislev, which usually falls during the month of December, but occasionally begins during November. Hanukkah (also commonly spelled "Chanukah") means "dedication" in Hebrew. The holiday goes back almost 2,400 years, and celebrates one of the greatest miracles in Jewish history, marking the survival of Judaism. Hanukkah refers to a second century conflict when Palestine was caught between two great Hellenistic powers: Egypt and Syria. Under Syrian power, there was a campaign to establish political and religious conformity by "Hellenizing" the Jews, commanding them to worship Greek gods while oppressing Jewish culture and religion. Even more serious, the Syrian emperor decreed that the Temple in Jerusalem, the national house of worship, would become a temple to the Greek god Zeus. A small band of soldiers led by Judas Maccabeus (also called Judah Maccabee) and his brothers staged a successful rebellion against the Syrians and rededicated the Temple. When Jerusalem's Temple was reclaimed, the Hebrews found it defiled by statues of the Greek gods and other religious artifacts. They cleared out the foreign icons and rededicated the temple on the 25th day of Kislev. Hanukkah celebrates the restoration of religious freedom and the preservation of Jewish customs as well as the traditional Jewish worship service. The "Festival of Lights" refers to the legend of a miracle that occurred during the rededication of the Temple. When the Jews sought to rekindle the menorah in the Temple sanctuary, they could find only one sanctified jar of oil - marked with the seal of the High Priest. Miraculously, the small portion of oil burned for eight days - the length of time required to purify new oil. 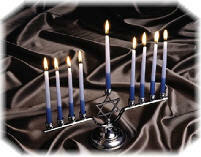 During the eight days of Hanukkah, a candle is lit each night to commemorate the miracle of the oil in the Temple. Nine candles are arranged in a candelabra called a menorah – one for each night, plus the shamash or shammus (meaning servant), the candle used to light the others. Candles are lit from left to right, and the shamash is placed in the middle at a different height. Families gather at nightfall to rekindle the menorah flames, rededicate themselves to their faith, and share in festive meals. Blessings are sung or recited as the candles are lit. Each night of Hanukkah may feature songs or readings, games and gifts ranging from "gelt" (money) to candy, to other small presents. One Hanukkah tradition, especially for children, is playing the dreidel game with spinning tops. On each of the four sides of the dreidel, there is one of the four Hebrew letters that stand for "Great Miracle Happened There." It is customary to eat fried foods on Hanukkah because of the significance of oil to the holiday. Special potato pancakes fried in oil called latkes are served as a reminder of the miraculous oil.